SPHERICAL PYRAMID MERKABA STARLET is a fully functional compact model especially useful when circumstances do not allow to install bigger instruments. The Starlet works as a good mood generator. It synchronises the brain in the lower scope of beta waves, preparing your mind to reach an alpha stage, but still living it attentive. Reaching the harmony in beta waves is for us exceptionally important, because they are responsible for our daily activity. The Starlet gives you a breeze of freshness making you eager to learn and act. This unique properties make the Starlet especially popular amongst the youth, who are still in their learning process, because the vibrations it emanates bring them naturally in a stage of mental balance. The Starlet can be also used for meditation. Because it is not as strong as Merkaba Alpha, the best is to sit right under it. After some minutes you will feel how it opens your crown chakra, connecting your mind with higher realms. Merkaba Starlet is gentle and discreet. 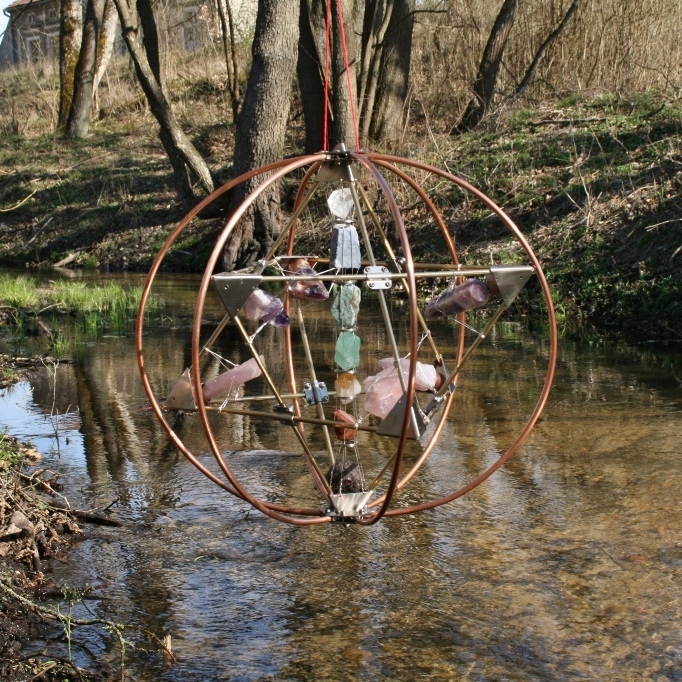 It's beautiful shape emanates calm and pleasant vibrations. Even the people who treat such instruments cautiously, accept the Starlet easily. Looking at it is inspiring and brings calm to your mind. When you hang it in a place where you meet guests, it will help to keep the positive and cheerful climate. When installed over your bed it will make your dreams conscious and clear. Brass tringles and diamagnetic stainless steel joints. Natural jewels synchronised with human bio-energy. The sphere made of pure copper increases the power by ca 35% and changes the energy pattern into toroidal. Height – 40 cm / 15,7"
Dowsing intensity – 25.000 units of Bovis scale (compared to the emanation of the natural Earth Chakra in Cracow, usually estimated at 120.000 units).